The Bellas are an all-female a capella group from Barden University who crashed out of the last International Championship of Collegiate A Capella after one of their singers, Aubrey (Anna Camp), threw up all over the first row of audience members in mid-song. Their disgraceful exit was made all the more unbearable by the fact that their brother group and bitter rivals, The Treble Makers, outshined them in that same competition. Now in the new year, with Aubrey leading, the Bellas carry out a recruitment drive to assemble a group that can make them genuine contenders again. The problem is that they have trouble finding new people willing to join as a result of their newfound notoriety and end up only having a small pool of talent to draw from. 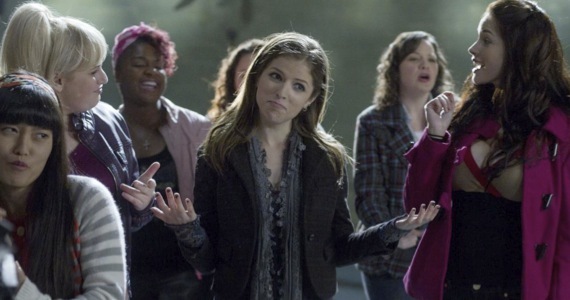 Meanwhile, Beca (Anna Kendrick), a freshman loner, treats university life with contempt. She only attends Barden because her father, a literature professor there, forces her. She thus insulates herself from campus life by interning at the university’s radio station. Her dream is to move to L.A. where she aims to be a DJ. Her father realises that she’s been cutting class and offers to let her move to L.A. providing that she first join a club and get more actively involved in the university’s activities. This leads her to successfully auditioning for The Bellas and teaming up with a bunch of characters that includes a low-talking Asian, Lily (Hana Mae Lee), an obese bogan, “Fat Amy” (Rebel Wilson), and a butch African-American lesbian, Cynthia-Rose (Ester Dean). Together, this seemingly mismatched group of songstresses prepares for the upcoming competition. If you’re searching for a simple popcorn flick that can make your blood rush, Pitch Perfect fits the brief. The entertainment that the film provides, as one would predict, comes from its humorous depiction of the individuals that form The Bellas, the catchy arrangements they perform and their being pitted against other formidable a capella groups in competition. At its best, the film can make you quiver with the sort of ecstatic excitement that Glee’s music often inspires. Unfortunately, most of the film suffers from a lack of thought, control and cohesion. Its screenplay repeatedly and shamelessly exploits shallow cultural stereotypes for empty laughs, for instance inserting tedious jokes about the social awkwardness of the story’s Asian characters and one-liners from “Fat Amy”. The characters are lazily drawn. Beca is particularly boring and lacking in charm, and she’s one of the lead characters! It gets worse. Moore mismanages the material so terribly that the Bellas’ ultimate song in the competition finals is much less exciting than their version of Bruno Mars’ “Just the Way You Are”, which was merely an improvisational group exercise that they did outside the competition. Moore then immediately follows up this anti-climax with another when he decides to distinguish this film from the similar films before it by omitting the scene where the winner of the competition is announced and celebrates – the cheesy scene that everyone excitedly waits for. Stupid. All in all, Pitch Perfect won’t manage to sustain your interest for its entire duration but it is fairly watchable.